Last Thursday, a bittersweet email arrived in the early afternoon. A male Lawrence's Goldfinch, Colorado's first, was visiting thistle feeders in Grand Junction, Colorado. I got a message on my phone minutes later- a crew of my buddies were leaving Boulder imminently to race the sunset west to Grand Junction- about a 4-hour trip. With work and family, I couldn't make the run. I was excited that Colorado had picked up another species for the state list (probably #485, pending acceptance of a few others in the queue), but bummed that I couldn't go for it- especially since it would be a lifer for me. My friends, however, heard the worst words that birders on a chase can hear- "you should have been here a few minutes ago..." As they were driving into Grand Junction, other birders were calling them to report that the bird was on the feeders even as they spoke. But minutes later, when they arrived, the bird wasn't there and didn't show up in the remaining light of the day. In sports they talk about the "quiet bus" that the losing team takes home- I'll bet that it was a quiet car that finally pulled away from the house in the darkness of Thursday night. Of course, after driving to the west slope my buddies didn't just head back home. They made a night run in some of the state's best areas for things like Flammulated Owl and were rewarded with success. Crashing for the night, they were then back at the feeders 1/2 hour before sunrise on Friday morning. No bird. For almost two hours they waited with no Lawrence's Goldfinch. They were about ready to leave when the bird finally appeared. I can't imagine the relief that they felt when this little stunner appeared among the Lesser and American Goldfinches on the thistle feeders. Meanwhile, I was back at work on Friday, waiting for news of the bird. The first report came after that morning visit, and an afternoon update indicated that the bird was coming in fairly regularly, about every 1/2 hour throughout the day until evening. 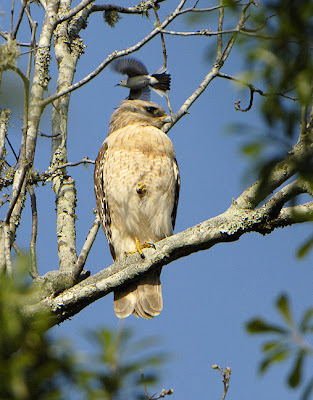 For added incentive, one of the LAGO seekers saw a Common Blackhawk at a nearby state park. A couple of other working bird buddies of mine hatched the crazy idea to make the drive on Saturday morning. Drive we did, earning the hairy eye of several state patrollers on saturation duty over the holiday weekend but avoiding any pullovers. We also got news en route that the bird was back, greatly cheering the mood of our car. Once there (almost 5 hours from when I left home) we waited a little over half an hour- one very long half hour- before the bright fellow appeared. NICE! We enjoyed several short visits over a couple of hours, soaking in the beauty of the little bird. Other birds like Gambel's Quail, Blue Grosbeak, and both expected goldfinches filled in the gaps between LAGO visits. 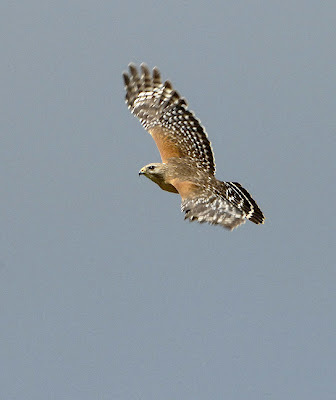 Photography was tough, because the bird was very small and moved about frenetically. I got some DSLR shots but opted to set up my digiscoping rig for subsequent visits in an effort to capture more detail since observers had to stay on the back porch, a bit far away from the feeders for excellent photography. At least the bird favored a particular feeder so I could pre-focus there and pretty much start hammering when it arrived. Lighting was kind of tough, too and I wasn't getting great shutter speed, so I knew most of my shots would be blurred by the bird's movements. So I basically just shot in continuous mode for about as long as the bird was there to try to get a few magic moments when the bird paused. 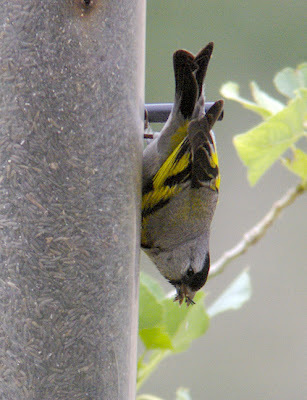 The pics of the bird show it upside-down because it liked one of those inverted thistle feeders- kind of a funny, Audubon-like pose but I can't complain. Big thanks go to Larry Arnold, who found the bird and graciously opened up his back yard for whomever wanted to go looking for the bird. As of this (Tuesday) morning, there hasn't been news of the bird, but it was around all yesterday. Hopefully that was long enough throughout the holiday weekend for folks wanting to see it to get their chance. In the new book Good Birders Don't Wear White, Robert Braunfield has a lovely chapter about enjoying all of the cool things that come with watching birds. Called Don't Forget the Peripherals, he expounds upon the delights of local diners where waitresses call you "hon", picnics replete with engine manifold-heated pastrami sandwiches, beer from a Thermos paired with olives from a jar, and pointing out awkwardly-named birds to non-birders. Good advice indeed- in the heat of a major twitch or under the stress of conducting a field trip it is easy to forget the good stuff that comes along with birding. A bit over a year ago, I had the privilege of participating in the legendary World Series of Birding along with Jeff Bouton and David La Puma. As Team Double XXposure, sponsored by Leica (gracias!) we competed in the digiscoping category and compiled a CD documenting our 102 species by the 10pm deadline, all photographed through Leica scopes in the rush of the big day. I'd have to rank that as one of best birding trips that I've done, not just because of the non-stop world-class birding on our scouting days and on the big day itself, but because of all of the crazy fun we had in our red-lined effort to break the century mark for birds digiscoped in a day. (Click on over here to see a more detailed account and our submission pics from the day...) Sometime in the afternoon, after a successful stop at Reed's Beach (where we snapped things like Spotted Sandpiper, Glossy Ibis, and Boat-tailed Grackle) we were driving back out when I dialed up the Flaming Lips' version of Queen's epic on my iPod and piped it through our rental van's speakers. Now if you don't know Jeff Bouton, you may not know that he is legendary for his karaoke skills- that guy has strong pipes! And La Puma is no slouch either, and I will always chime in, too. So here we were bailing out to get to our next stop, windows down, singing Bohemian Rhapsody at the top of our lungs, putting Wayne's World (remember that scene?) to shame. I'm grinning now remembering it, and whenever I hear the song, even by a guy who plays it on his hands, I can't help but remember that day. I think that music is one of the peripherals that a lot of birders really enjoy. Bouton isn't alone in his fondness for belting out songs into a communal mike- Amy Hooper, Jeff Gordon, and Sharon Stiteler all espouse the virtues of a good karaoke bar within striking distance of a birding festival. Gavin Bieber even ran his own karaoke business with his wife, carting the rig from bar to bar for karaoke nights (& maybe still does- I'll have to ask him the next time we cross paths.) Ted Floyd has a piano in his living room and rumor has it that he can tickle the ivories. Bill Thompson III often posts song lyrics on his blog and reports on gigs where he and his wife Julie Zickefoose play, (yeah, they're in a band for goodness sake.) And a road trip with Tony Leukering just wouldn't be the same without his steering-wheel drumming to classic rock tunes. But some of my favorite music/birding mash-ups come from Tom McKinney, who works in music themes throughout his birding diary. He dutifully counted down to Iron Maiden's UK visit last year, and comes up with some crazy music videos (find his May 20 post, for example.) So in that vein I'll post the classic that started it all, Queen's Bohemian Rhapsody. Sing along, won't you? Hey, You- Get Out Of My Tree! So a few weeks back when I was in Louisiana for the ABA's annual convention, my first trip was to Lake Fausse Point State Park. 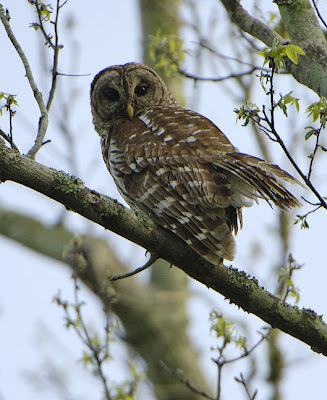 The trip started pretty well when the bus unloaded right under a cooperative Barred Owl- dang cool! 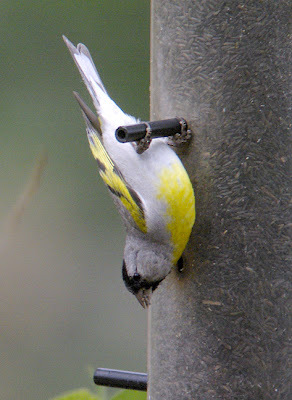 Why are the birds seemingly so cooperative down south and so secretive up north?? Maybe has something to do with the subspecies?? 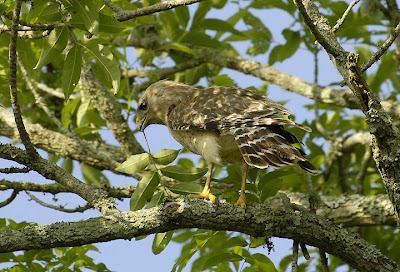 Ned Brinkley mentioned that these southern birds have bare feet, while the northern ones have feathered footies. 'Ya learn something every day, especially when birding luminaries like Ned are around. 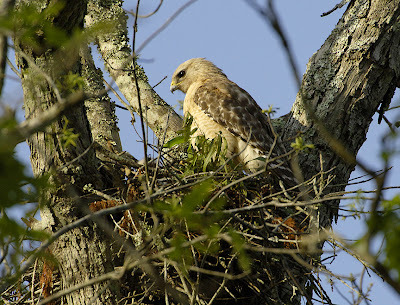 The highlight of the trip for me, though, was a Red-shouldered Hawk family nesting prominently in the middle of a groomed picnic area. 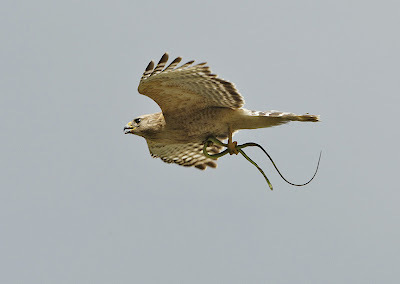 Mom & dad were in attendance, taking turns bringing in leafy branches- an interesting behavior. At least one chick periodically peeked out from the nest, but I'm not sure of the count since I only saw one at a time. It was really neat to study these forest-loving birds in a fairly open setting- by far these were the best prolonged looks I've had of Red-shouldered Hawks. They seemed really pale, particularly in comparison to birds I saw in California last fall. In the Sibley guide these seemed closest to his illustration of Florida birds- I wonder if that subspecies or a similar one wraps around some into Southern Louisiana, or if they just show a lot of variation like many other buteos. One of the adults took a break, perching in another tree near the nest. Apparently, this was some kind of social gaffe in the eyes of this Blue-gray Gnatcatcher. Taking umbrage that the hawk was in its tree, the wee gnatcatcher dive-bombed the hawk, even making contact with the hawk's crown on the most daring dives. The hawk reacted by totally ignoring its diminutive tormentor, dozing lightly, peering about, and preening throughout the sporadic attacks. The gnatcatcher didn't relax, though, insisting on staring down the hawk from a nearby elevated perch when it wasn't in active attack mode. All of this was fine and dandy, but then the icing on the cake came when one of the adults approached the nest calling loudly and carrying a snake. Fortunately, it detoured to another tree, maybe awaiting clearance for its final approach. The delay let me run (literally) down the road a bit in anticipation of the bird flying across to its nest, getting the sun behind me. There wasn't anything I could do about the overcast sky, but I was pretty darned pleased with the result. My naturalist friends tell me that this is a Rough Green Snake. It might be my favorite picture so far from 2007. In the "you never know who will want your pics" category, I got an email a few month ago from an acquaintance at Cornell University whose colleagues had an upcoming article in the journal Ecology. 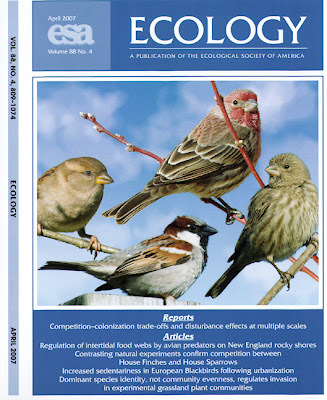 They wondered if they could use a House Finch picture of mine for their article about competition between House Sparrows and House Finches, and it turned out to be part of the cover (a montage of House Sparrows and House Finches.) Mine's the female House Finch- pretty flashy, huh? Oh well. The funny thing is that I traveled about 3 feet to get the shot- I took it out of my office window one winter day. When the bugs are frozen out for the season I take the screen out of that window so I can snap birds perching in the tree branches. Now that's good bang for my travel buck, but my house is one expensive photography blind! The refuge was a great place to photograph birds- I got my photo lifer #560 (Fulvous Whislting-Duck) there. Stay tuned for some pics when I finally get them processed.